Michael began at the age of 16 at the Institute of Jewelry Training. Eager to continue to develop his skills, he apprenticed with VanCraeynest, Inc. in San Francisco for 6 years. It was here where he learned the fine art of jewelry making based on old world techniques such as forging, toolmaking, carving and chasing. As an apprentice he was given the gift of time and repetition in learning new skills. This is the basis of his early career and it shows throughout his work. 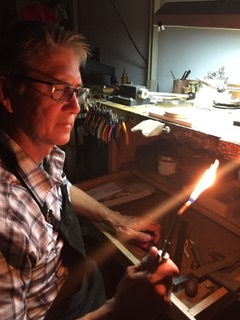 Michael went out on his own in 1999 and formed Michael R. Kosinski, Fine Jewelry Design / Manufacture. Several years ago he began sharing his knowledge with students and discovered a passion for teaching. 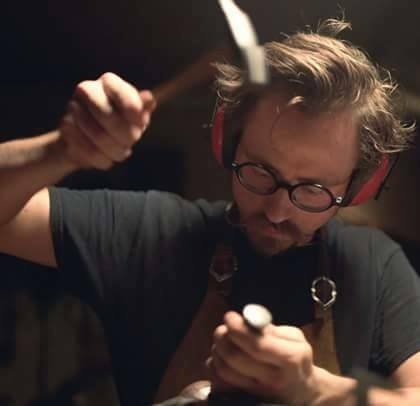 Michael is the co-founder of Metal Arts Academy. Douglas is a raising and chasing artist, focusing on hand forging ferrous metals into life like forms. He has been forging sheet metals since 2005, his gateway into the metal art world was making period armour for full contact sports. In 2011 it was armouring techniques that introduced him to a much larger world of raising and chasing. These days, Douglas explores the plasticity limits of sheet metals and how to apply them to decorative metal works, vessel work, and public sculpture. Keith is trained in Waldorf education for both elementary grades and high school as well as trained in the practical art of therapeutic education from the UK. Keith is a self-taught coppersmith and blacksmith specializing in 1500 BC blacksmithing. Keith has taught blacksmithing in Japan and across the United States. Keith works with students around the country teaching woodworking and Waldorf crafts and he teaches young adults with autism transferable skills through crafts. His love of learning shows in his many skills which he shares with his students. He is also a self-taught beekeeper, the first and currently the only Demeter certified Biodynamic beekeeper in the US.